“You Can’t Take it With You” was performed on Thursday 3, Friday 4, Saturday 5 April, 1952, at the Theatre Royal. 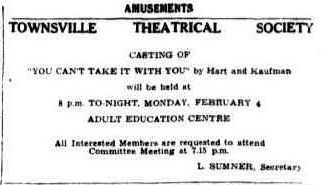 Townsville Theatrical Society last night gave Hart and Kaufman's magnificent comedy of American life, manners and philosophy, 'You Can’t Take It With You,' the complete 'works'— complete even (literally) to the last fire cracker. The performance was rollicking and uninhibited to an extremely successful degree. Its second act curtain almost brought down the house. Perfectly synchronised, it was probably the liveliest the Theatre Royal has seen. Most memorable portrayal was Lou Sumners' Grandpa. He underplayed, used perfect timing, was easy, gracious and unflurried to bring a professional competence to his role. The play throughout is a piece of delightful nonsense, expounding the favourite comedy theme of American playrights that money is a dreadful extravagance which you can't take with you. In the hands of Moss Hart and George S. Kaufman, however, the theme seems the product of genius. It is set in a New York home peopled by the strangest family ever to mount a stage. Head of the clan is Grandpa, who set out to his Wall Street office 35 years ago, decided in the lift that the effort wasn't worth it and never went back. His daughter Penny (Thelma Bourke) is a scatter-brained, charming person who decided to write plays because eight years ago a typewriter was delivered to the house by mistake. Her husband Paul (Pat Daunt) makes fireworks in the cellar. 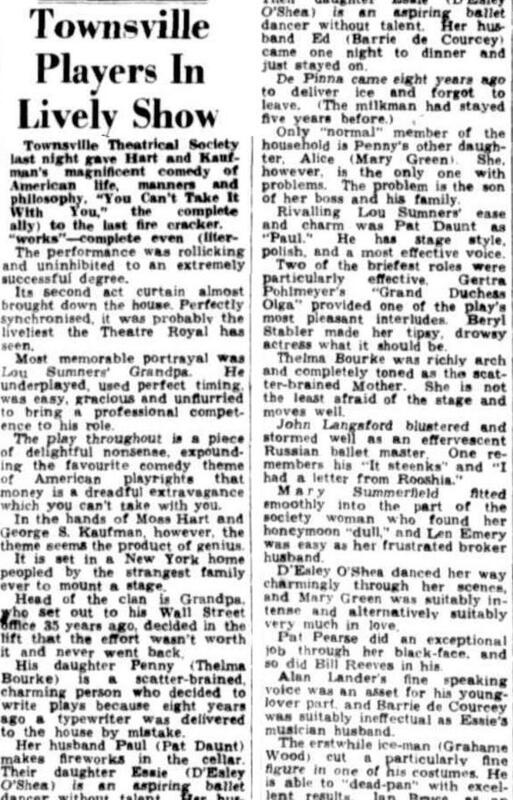 Their daughter Essie (D'Esley O'Shea) is an aspiring ballet dancer without talent. Her husband Ed (Barrie de Courcey) came one night to dinner and just stayed on. De Pinna came eight years ago to deliver ice and forgot to leave. (The milkman had stayed five years before). Only 'normal' member of the household is Penny's other daughter, Alice (Mary Green). She, however, is the only one with problems. The problem is the son of her boss and his family. Rivalling Lou Sumners' ease and charm was Pat Daunt as 'Paul.' He has stage style, polish, and a most effective voice. Two of the briefest roles were particularly effective. Gertra Pohlmeyer's 'Grand Duchess Olga' provided one of the play's most pleasant interludes. Beryl Stabler made her tipsy, drowsy actress what it should be. Thelma Bourke was richly arch and completely toned as the scatter-brained Mother. She is not the least afraid of the stage and moves well. Mary Summerfield fitted smoothly into the part of the society woman who found her honeymoon 'dull,' and Len Emery was easy as her frustrated broker husband. D'Esley O'Shea danced her way charmingly through her scenes, and Mary Green was suitably intense and alternatively suitably very much in love. Pat Pearse did an exceptional job through her black-face, and so did Bill Reeves in his. Alan Lander's fine speaking voice was an asset for his young lover part, and Barrie de Courcey was suitably ineffectual as Essie's musician husband. The erstwhile ice-man (Grahame Wood) cut a particularly fine figure in one of his costumes. He is able to 'dead-pan' with excel lent results. Ian Bruce, as an out-manoeuvred income tax agent, had one richly hectic moment. Last night's performance of 'You Can't Take It With You' would surely not have displeased its exacting authors. It was rich, fast, and always amusing, and frequently hilarious. Some of the players, however, had a little voice trouble and the incidental music should certainly be softer. The play will be presented again to-night and on Saturday.